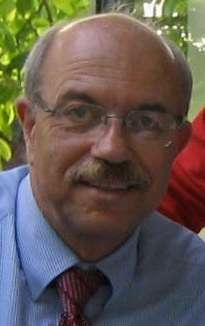 Kyriacos Costa Nicolaou (Greek: Κυριάκος Κ. Νικολάου) is a Cypriot-American chemist known for his research in the area of natural products total synthesis. He is currently Harry C. and Olga K. Wiess Professor of Chemistry at Rice University, having previously held academic positions at The Scripps Research Institute/UC San Diego and the University of Pennsylvania. K. C. Nicolaou was born on July 5, 1946, in Karavas, Cyprus where he grew up and went to school until the age of 18. In 1964, he went to England where he spent two years learning English and preparing to enter University. He studied chemistry at the University of London. (B.Sc., 1969, Bedford College; Ph.D. 1972, University College London, with Professors F. Sondheimer and P. J. Garratt). In 1972, he moved to the United States and, after postdoctoral appointments at Columbia University (1972–1973, Professor T. J. Katz) and Harvard University (1973–1976, Professor E. J. Corey), he joined the faculty at the University of Pennsylvania where he became the Rhodes-Thompson Professor of Chemistry. While at Penn, he won the prestigious Sloan Fellowship. In 1989, he relocated to San Diego, where he took up a joint appointment at the University of California, San Diego, where he served as Professor of Chemistry, and The Scripps Research Institute, where he was Darlene Shiley Professor of Chemistry and Chairman of the Department of Chemistry. In 1996, he was appointed Aline W. and L.S. Skaggs Professor of Chemical Biology in The Skaggs Institute for Chemical Biology, The Scripps Research Institute. From 2005 to 2011, he directed Chemical Synthesis Laboratory @ ICES-A*STAR, Singapore. In 2013, Nicolaou moved to Rice University. The Nicolaou group is active in the field of organic chemistry with research interests in methodology development and total synthesis. He is responsible for the synthesis of many complex molecules found in nature, such as Taxol and vancomycin. His group's route to Taxol, completed in 1994 at roughly the same time as a synthesis by the group of Robert A. Holton, attracted national news media attention due to Taxol's structural complexity and its potent anti-cancer activity. ↑ Borman, Stu (21 February 1994). "Total Synthesis of Anticancer Agent Taxol Achieved by Two Different Routes". Chemical & Engineering News. Retrieved 22 August 2013. ↑ Blakeslee, Sandra (15 February 1994). "Race to Synthesize Cancer Drug Molecule Has Photo Finish". The New York Times. Retrieved 22 August 2013. ↑ "Arthur C. Cope Award". ACS. Retrieved 19 January 2015. ↑ "New Fellows 2013". Royal Society. Retrieved 30 July 2013. ^ Nicolaou, Kyriacos Costa; E. J. Sorensen (1996). Classics in Total Synthesis: Targets, Strategies, Methods. Wiley-VCH. ISBN 3-527-29231-4. ^ Nicolaou, Kyriacos Costa; S. A. Snyder (2003). Classics in Total Synthesis II: More Targets, Strategies, Methods. Wiley-VCH. ISBN 3-527-30684-6. ^ Nicolaou, Kyriacos Costa; J.S. Chen (2011). Classics in Total Synthesis III: Further Targets, Strategies, Methods. Wiley-VCH. ISBN 3-527-32957-9. ^ "Benjamin Franklin Medal in Chemistry". Franklin Institute. 2011. Retrieved December 23, 2011.